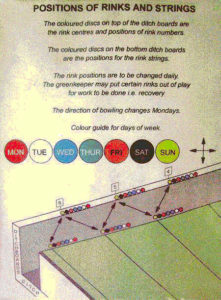 To lessen the wear on the green, the direction of play is changed on Mondays of each week, and rink positions are changed daily. 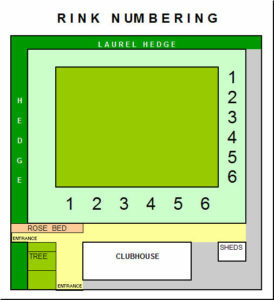 The rinks are numbered from 1 to 6, starting in the far left hand corner furthest away from the pavilion. In this way, when playing parallel to the pavilion, Rink No.6 will be nearest to the pavilion, and on the far right when playing at right angles to the pavilion. It is the responsibility of the person or persons setting up a rink for play to follow the directions outlined on the accompanying chart, a copy of which is displayed in the equipment store. When laying out equipment for Matches and Competitions in the weeks when play direction is across the front of the pavilion, please ensure that games start from the ‘Hedge End’, i.e. to the left of the pavilion. This will improve safety and give more room for Players on lower numbered rinks to pass back and forth. When setting up Rink 6 in this direction, it is suggested that rink equipment (score board, measure stick, etc.) is placed along the side of the rink facing the rose bed. Our normal weekly programme for the use of the green and its six rinks is outlined in the table below. Club Competition matches, friendly roll-ups and practice sessions should be booked for times which do not clash with pre-arranged league and friendly matches (as they appear in the published Fixtures Handbook). A booking form for doing this is displayed in the Clubhouse. * If a member wishes to use a rink which has been reserved for a club fixture, please tell the Captain at least 7 days (or as soon as possible) before required. If a member wishes to use a rink (which has been reserved for other than a club fixture), please consult the person who has booked the rink at least 24 hours before required. Normally this would be necessary only if there was no other rink available at the time required. NOTE: RINKS SHOULD NOT BE BOOKED FOR ROLL-UPS EXCEPT THAT TWO OR THREE RINKS ARE RESERVED ON MONDAY AFTERNOONS, AND THREE RINKS ON CLUB EVENINGS i.e. TUESDAYS, FOR ROLL-UPS.